The function of lipid transport is to facilitate the transfer of ex ogenous and endogenous triglycerides and cholesterol from their sites of absorption or formation to their sites of storage and utilization. This function is carried out by triglyceride-rich lipoproteins of intestinal and hepatic origin through a series of enzymic conversion reactions resulting in release of triglyceride fatty acids and generation of cholesterol-rich remnant lipoproteins. Under normal, steady-state conditions, the input and output of triglyceride-rich lipoproteins are balanced with little or no change in their plasma levels. 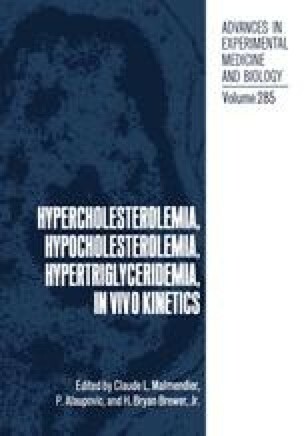 However, an increased influx and/or a decreased efflux of triglyceride-rich lipoproteins from the plasma compartment have been identified as main pathophysiologic mechanisms leading to hypertriglyceridemia1. The increased formation and/or decreased removal of cholesterol-rich lipoproteins results in hypercholesterolemia which may or may not accompany typically hypertriglyceridemic states. Deranged lipid transport processes are of great clinical significance, because they are identified as one of the main factors responsible for the genesis and development of atherosclerosis2–4.